If you don’t know about Blake Mycoskie and his company, TOMS Shoes – you must be living under a Rock. 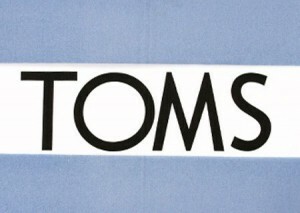 For every pair of shoes you buy from them, TOMS will give a pair to a child in need. I first heard of TOMS several years ago and have owned a few pairs and bought them as gifts for friends and family, but when I got to hear the founder of the company, Blake Mycoskie speak at the Willow Creek leadership Summit last year I was very impressed with him. I was most impressed with his economic ingenuity and his determination to create self sufficient ways of providing for people in impoverished countries. This came alive for me, when I took this picture in Haiti last month. Blake is a Christian and was on the reality series The Amazing Race when he first encountered the simple problem that many children have in developing countries: they don’t have shoes. This is especially intriguing considering the number one cause of disease in these countries is soil-bourne parasitizes and bacteria, meaning that in many cases basic hygiene and wearing shoes can prevent these diseases. “TOMS” is not a name of person but rather an ideal – its short for “Tomorrow” meaning these shoes are providing for the next generation in these countries. But most impressive about this charity, is that it isn’t a charity at all – its a for-profit company that is totally self-sustaining and its model has inspired many other similar companies to adopt their one-for-one strategy. In short, TOMS has made compassion cool. To borrow Tim Elmore’s language from his book Generation iY, this generation isn’t compassionate – they are ‘fassionate’ and this company fits the bill. 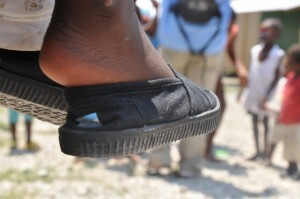 TOMS has become so popular that several other companies are mimicking their gimmick – Sketchers started ‘BOBS’ a blatant rip-off of TOMS. They boast that for the same price as a pair of TOMS that you can get a pair of BOBS and they will donate TWO pairs of shoes to a child in need. I think sketcher is missing the point, however – TOMS is a people company that is more about a movement then it is about a price or numbers. For example, for the past two years TOMS has organized ‘A day without shoes’ to promote awareness about the shoeless children in developing countries. Thousands of people, including myself, went without shoes in an effort to get the word out. Can you think of any other shoe company that has done anything like this? That’s because its not about the shoes, its about the people, and to go further to the point, Blake makes a point that every pair of shoes they donate is taken into a village and put on the feet of a child. You can hear more about this in the shoe drop video below. Tom’s biggest mode of advertisement is word of mouth. In addition to their ‘Day without shoes.’ They have thousands of people who are walking around wearing TOMS and telling their friends about how they can get involved – it spreads like wildfire. They’ve taken great advantage of social networking, continually posting shoe drop videos. Last fall they topped on million shoes given to kids.